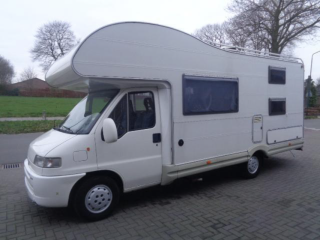 A neat and complete Ford Transit camper with Rimor superstructure. The camper can be driven with a driver's license B and runs on diesel. In this camper is a complete inventory for up to 6 people. So take a pillow and sleeping bag and go! 2 people can sit in the front, behind them is a dinette for 4 people with belt seats. 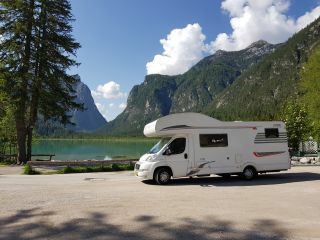 Above the driver is a 2 person alcove bed available, the dinette can be converted into a double bed and also in the back of the camper is a spacious (French) bed. Below that is a spacious garage for a lot of luggage or a moped or scooter. This camper is ideal for groups or a family due to its layout. He is not very big so easy to control but still very spacious inside. For 6 people glasses, plates, cutlery etc. A possible car can be stored for free during the rental period. 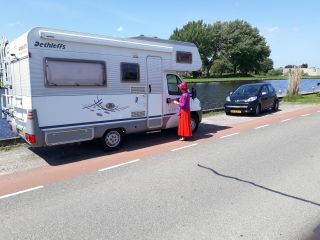 The day the camper is brought back I also count as a booking night, because I can not rent it anymore that day. He must be surrendered that day before 17:00. You can pick up the first booking day from 9:00 am. If you want to rent the camper you have to book an extra night. For more information you can send me a message. Why just rent this camper?